Employee wellness programs globally, have become a staple in many corporations as a way to attract top talent, keep them happy and productive, and decrease employee turnover. More so in Greece, where the financial situation has led to increased pressure while reducing employee benefits overall. But the key to having a successful corporate wellness program is by encouraging overall wellbeing while still keeping it fun. If you can’t get your team engaged then your wellness program ideas will quickly lose steam. So make your initiatives fun, try new ideas and see what your team values the most. 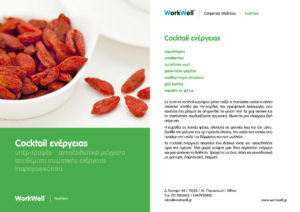 Healthy snacks aid in weight control, improve mood, and boost energy, making it a no brainer to provide for your office. 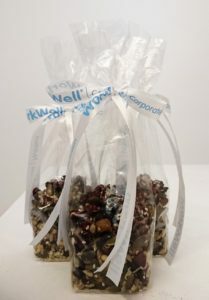 If you’re already providing snacks to your employees, consider making the switch to healthier alternatives like bars and balanced mixes of nuts with dried fruits. There’s a lot of marketing around the food industry that tricks people into thinking certain foods or diets are healthy, when in fact they are not. Authority Nutrition does a great job of addressing some of the most common nutrition mistakes that you can share with your team. 7. PUBLISH A WORKPLACE WELLNESS NEWSLETTER HIGHLIGHTING THE BEST FITNESS, NUTRITION, AND EDUCATIONAL CONTENT FROM AROUND THE WEB – or simply ask WorkWell to do that for you! If you offer your team snacks or meals with no nutritional value, make the switch to healthier alternatives. At the very least offer a majority of healthy items and just a few traditional junk food items. Varidesk offers adjustable-height standing desks that allow users to easily switch between standing and sitting while working. Companies are replacing their old vending machines with new, healthier options like bars that come these days with a great variety of options and the cost is similar. Invite local vendors and companies to your office for a day to talk about nutrition and wellness initiatives. You should have no problem at all persuading local businesses to attend, as it’s a great way for them to promote their service. Don’t waste time and energy on corporate wellness initiatives that employees don’t find engaging or beneficial. Use HR Survey tools or Google Forms to create a survey to collect feedback from employees. Sitting at a desk staring at a computer for hours is the fast track to back pain and eye strain. 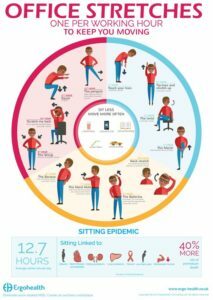 Email this infographic for better posture and this one for eye strain to your people.